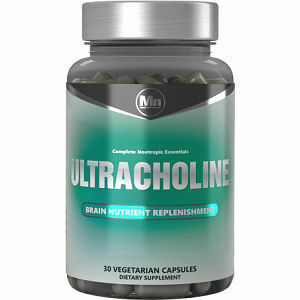 This is a review of the supplement Mind Nutrition Ultracholine. This product claims to stimulate acetylcholine synthesis and production, improve memory, enhance concentration, and promote the development of healthy receptors. It can also reduce anxiety, improve mood, and reduce brain fog. You will learn more about Ultracholine as you read further. Docosahexaenoic acid: It supports the optimum synthesis of phosphatidyl choline (PC). It is also an essential structural component of neurons. Uridine 5’-Monophosphate Disodium Salt: contributes to the synthesis of phosphatidyl choline. Α-Glyceryl-Phosphoryl-Choline (Alpha GPC): increases acetylcholine levels and supports the production of cell membranes. Huperzine A (Huperzia Serrata): increases acetylcholine levels by obstructing acetylcholine esterase, the enzyme that plays a major role in acetycholine breakdown. Huperzine can also enhance memory and the ability to consolidate new information. Users are advised to take one to three capsules between meals. You should not take more than 6 capsules within a period of 24 hours unless you are advised by a medical professional to do so. Persons under 18 years, pregnant women, and breastfeeding women are warned against using this product. They should contact medical professionals for assistance. The same applies to people with any medical condition and those taking medication or other dietary supplements. There is no succinct information from the manufacturer about the actual side effects that might occur after using this product. However, the manufacturer advises users to discontinue use in case they experience adverse reactions after taking the capsules. Therefore, there is a possibility of experiencing some side effects after consuming the product. A bottle containing 30 vegetarian capsules costs £20.95 without VAT. A bottle containing 60 vegetarian capsules costs £39.95 including VAT. This is a good price because it is neither low nor high. You can trust the quality of this product based on the reasonable price. We did not find any money-back guarantee from the product’s manufacturer. The lack of a guarantee implies that users lose their money if they do not experience the claimed benefits of using the product. Additionally, we did not find adequate customer reviews to determine the success of this product. This lack might be a concern for some consumers, especially those planning to use the product for the first time. Ultracholine could be an acceptableproduct for you due to a number of reasons. First, this product is made of several trusted ingredients, which make a strong formulation for users who want to improve memory, enhance concentration, stimulate acetylcholine synthesis, and reduce anxiety. Secondly, the price of the product is reasonable meaning that it is unlikely to raise quality issues among potential consumers. However, the absence of a satisfaction guarantee is a major concern because consumers need assurance that this product is effective. Moreover, there is no adequate information from those who have used the product to prove that they have experienced the benefits. Nevertheless, Ultracholine is a good choice based on its benefits. Henry Costa	reviewed Mind Nutrition Ultracholine	on June 29th	 and gave it a rating of 2.